On Monday 19th September, at least 12 racist posters were found on a campus of an American University. The posters, which have since been removed by the University of Alberta, were titled: ‘Fu*k your turban’ and featured a photo of a Sikh man wearing a turban. At the bottom of the poster there was a website link to ‘Immigration Watch Canada’, an organisation that aims to dramatically reduce immigration levels to Canada. The organisation issued a statement on its website on Tuesday saying it did not sanction the distribution of the material and denounced their use. The statement issued by the group said: “We wish to inform our supporters that we strongly condemn this flyer and permission was not sought from our board for this to be circulated. The World Sikh Organization of Canada also issued a statement condemning the posters following the incident. As a response to the incident, the group posted a meme with the hashtag #FunkYourTurban, which has since gone viral online. 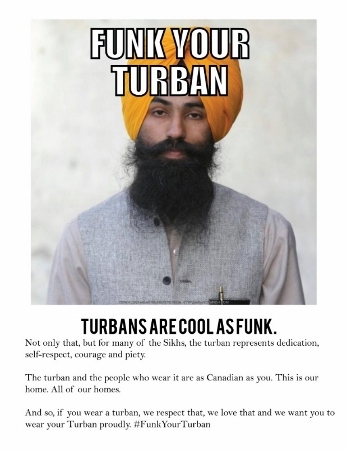 The meme was a satirical response to the racist posters and features a photo of a turbaned Sikh man with the caption ‘Turbans Are Cool As Funk’ written across it. It was created by Calgary-based campaign strategist Zain Velji, a former student at the University of Alberta.